When we invest time and money on something, we want to be assured we're not squandering our resources. Hiring an outsourced WordPress developer is no exception. These four criteria here combined account for the value you're hoping to get for the money you invest. They stand true for any types of development work you could think of: speed optimization, fixing an issue on your checkout page, white screen of death. You name it. However, life gets in the way and what you're hoping to achieve by hiring a developer might end up being different from your expectations sometimes. That's what you should try to keep to a minimum and lower its chances of happening to your business. So how do you know you've hired the right WordPress developer for your job? How can you be sure you're working with the right developer? It all starts with the developers you're engaging with: if they're already lacking key business aspects or other character traits you deem important, you're shooting yourself in the foot right from the start. Is the developer not able to explain the answers to your questions properly? Is the developer not providing any status update? Is their English so poor you can't understand what they're writing to you? Can they explain their points so that you can understand them clearly? Is the developer late on your first calls? What about deadlines: are they met? Do their documentations often feature spelling and/or grammar mistakes? Do you often spot something in their deliverables that requires additional work to be fixed? Is the developer able to provide you with examples from previous jobs similar to your current project? Ask the developer where they actually put their code. If they changed some core files of plugins, that's a huge red flag because you won't be able to update those premium plugins without losing those changes. And that's a nightmare because you just have to pay someone else to do the same work one more time. On the other hand, if they grouped their code in a child theme or in a custom plugin that is already a good sign because it means they have been following best practices for WordPress development. Is the template or theme they've developed meeting your requests for a new WordPress site? Are all the elements on the page neatly aligned, according to your design? Is the form validation correctly showing users there's something wrong with their order? Is the form submitting the data correctly in your backend? Is your admin showing you any error? Does the plugin pass all your test cases based on your test plan? Does the plugin work for both admins and regular users? Does the plugin work for both logged-out as well as logged-in users? Pro tip: are there any errors in the browser console? When the deliverable works as you expected, you should be happy. But that's not the best possible scenario you can get: when working with a WordPress developer, your focus should be evenly split on checking the deliverables extensively but also evaluating how much attention has been paid to details both directly and indirectly related to them. You need to build a higher confidence you're working with the perfect developer for your project. And deliverables alone, although important, can't guarantee it. The neatness of the execution is an essential indicator: if a developer is good on 'the surface', they also put efforts into the deeper tasks you've hired them for. Are there any obvious logic errors in the code? Looking at the requirements, are all cases fully implemented? Are the new automated tests enough for the new code? Do existing automated tests need to be rewritten to account for changes in the code? Does the new code conform to existing style guidelines? Are there any potential security issues? Are there any potential performance issues? A code review can occur in three different scenarios: a) you're a developer, b) you have in-house resources that could run code reviews, c) you can hire a third-party developer to perform the code review and report back to you. If either a) or b) are applicable to you, you know already how to conduct a code review and you might even have a process internally. This should be a one-time investment because once the code of a developer is reviewed, the quality of their work becomes quite evident and the need for future reviews declines. Development work for mission-critical projects can sometimes cost thousands of dollars. Paying another developer to review part of the code delivered during the early project phases becomes a negligible cost and, it should never be forgotten, it's an investment ultimately. 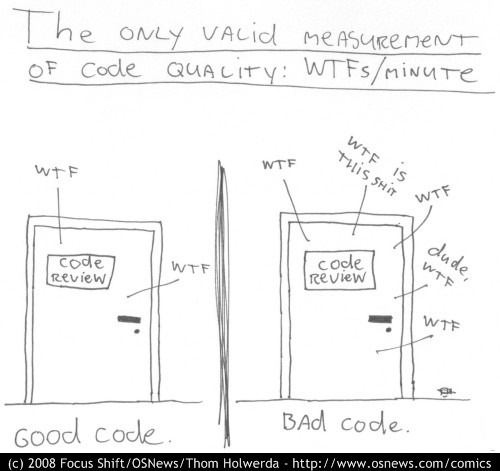 Code reviews are an industry-wide practice. Developers who are well-versed in what they do will never object or react to it if they find out that you have had one done for their work. If you have a project worth a few thousand dollars, don't think that this code review will cost you a fortune. You just need someone for a couple of hours. Once you have the green light, you'll know you are on a trusted path. Once you know your WordPress developer delivered good code, you'll know with a higher level of certainty that you can rely on their work. That means you don't need to pay for further code reviews again. Code reviews are important, I get it. But how can I be sure the developer I hired to review my current developer's code will be 100% honest and won't try to sell me any additional work? In other words: how can you be sure that the third-party developer won't play the "serviceman card." You know, the one where a serviceman comes at your house to do their job. Then, after months or years, the next one comes in and says: "Oh, my God. Who did this job for you? Let me fix it." And the next one again states the same words. It seems like you've reached an impasse ... but you have not! If you want to go the extra mile and find a developer whose way of working is transparent, appreciated, and ethical, you should look through these assets. Specifically, you'd need to pay attention to keywords you deem important in their reviews, which words people used when they referred them to you, which words support their portfolios. I'd look through their reviews for clients mentioning work ethics, honesty, nice character traits or something like that. This way you increase your chances of ending up in good hands. This approach is an additional tool you could leverage to have higher chances of your investment being successful. A further step to get you closer to being 100% sure your developer is a good one. In the end, though, you should be aware that it's a trust issue the one you need to mitigate or keep under control (and Codeable can help you overcome it). Understanding whether the WordPress developer you just hired is a good fit is a concern every business owners hiring developers will experience at least once. Since it has its nature rooted in how we trust other people, it might seem hard to overcome. If you're a non-technical person, you might even feel doomed. But here's the news: you're not doomed! There are effective ways to address this (understandable) business concern, all of which can provide you with crucial feedback and help you decide what your next move should be.